I’m John O’Gorman, although I initially joined the Irish Club in 1964, I did not become a fully active member till 1986, as my first passion was rugby with the Hamilton Hornets (since 1961). I have been on the Irish Club executive every year since 1993. 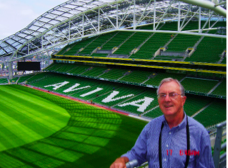 My photo is at Aviva Rugby stadium in Dublin. You can reach John at pastpresident@irishclubhamilton.ca.